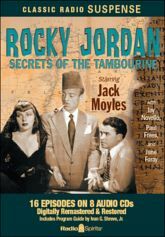 "The Caf� Tambourine, crowded with forgotten men from the world's waterfronts, alive with the babble of many languages�"
Explore 16 classic adventures of Rocky Jordan, hard-boiled proprietor of the Caf� Tambourine, as he solves crimes and mysteries in Cairo "where modern adventure and intrigue unfold against the backdrop of antiquity." This fascinating series of foreign follies makes full use of its exotic locale and music score to deliver a memorable listening experience. If you liked movies like Casablanca, you're sure to enjoy this series. Starring Jack Moyles as Rocky Jordan and Jay Novello as Captain Sam Sabaaya. Digitally remastered and restored for your listening enjoyment, the collection also includes a Program Guide by Ivan G. Shreve, Jr. with photos and background information about the show.